Denizens are an eclectic, noisy band from Brisbane. Denizens started as an avenue for Adam Bloom's solo material to be played live, but transformed into its own being. Like Faith No More, or Primus, the clashing personalities within the band developed a distinct original sound. They have rocked many underground venues in Brisbane; like The Bridge Club (Irish Club), The Basement (now Crow Bar), Music Kafe, and have been known to melt faces at parties. 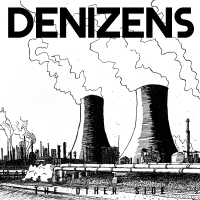 Denizens’ first release was a full-length album, “Reckon That Plane Crash Made Me Stronga”. It covers wide musical territory – from fast 90’s style punk to an industrial epic (the title track) about a holiday gone awry. Their latest album "The Other Side" is a lo-fi, ballsy, post-apocalyptic journey through some classic territory of human thought. It features their new drummer, Andrew Fitzpatrick, who brings some technical wizardry and subtle emotional touches.